National organisations are involved in the rehabilitation of wildlife. Companion animals that have been ill-treated or abandoned may need extra care through rehabilitation before they can be considered for re-homing. There are also private commercial businesses that offer rehabilitation for sports animals and pets that have suffered injury or reduced performance. 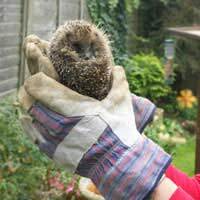 Wild animals that have been hit by cars, birds that have fallen from nests, orphaned or abandoned litters of hedgehogs; these are just a few examples of the types of incidents that make rehabilitation an option. Specialist branches exist under the general title of rehabilitation for wildlife. For example, rehabilitation centres near the coast have specialist knowledge and facilities to deal with injured sea birds and mammals (otters, seals, whales, dolphins, porpoises.) If an oil slick hits an area of the coast, emergency rescue plans are put into place and local experts have the backing and support of other coastal rehabilitation centres. Affected wildlife can be caught and treated as quickly as possible to minimise shock and reduce exposure to whatever harmful substance has been spilled. Raptors (birds of prey) are another species that require specialist attention if sick or injured. There is a national network in existence to provide advice and care for birds that are found injured, most commonly after falling from their nests, or orphaned by the actions of unscrupulous people. Badgers, hedgehogs, deer, all may be treated at local wildlife rehabilitation centres across the UK. Not all pets are lucky enough to have good permanent homes. For some, the ill-treatment and neglect they suffer means they need to learn how to trust people again. Some need to be under immediate veterinary supervision for life-saving treatment. Wherever possible, these animals are fostered to expert homes where they can be cared for and their progress monitored. A full case history is compiled for each animal over a period of time. This covers an assessment of individual temperament, socialisation and response to people in various situations; like how the dog or cat responds to being alone. Strays without any known history have ongoing assessments during their time in rehabilitation care. Abused animals need a rehabilitation programme that deals with more than just their physical healing for them to be able to recover fully. What is the Point of Rehabilitation? Rehabilitation means to help restore something (or someone) so that they may be able to readapt. The first step is made by getting an injured, sick, or ill-treated animal to a place of safety, the rehabilitation centre. Veterinary diagnosis and treatment, where possible, can then take place (including euthanasia if that is considered to be the most humane course of action). Once any life-threatening injury or condition has been attended to, the individual animal’s welfare is carefully considered. Habitats may be under threat or even lost. This is another aspect for consideration when the proposed rehabilitation of wildlife is being planned. There are different reasons for rehabilitating animals, accidental injury, environmental dangers, ill-treatment and neglect or because their owners wish it. The treatments and outcomes are varied too, but for anyone considering voluntary work with animals, this is an extremely rewarding and educational job.